It’s been a year since my lifelong friend, Robin, passed away, so I’ve been contemplating our relationship and good times. It’s hard to believe it’s over and done. We all have opportunities to love and enjoy life, and Robin certainly did. What a gift! His worldly possessions have been dispersed as he wanted. Among the items he left me was a fairly large collection of photographs. 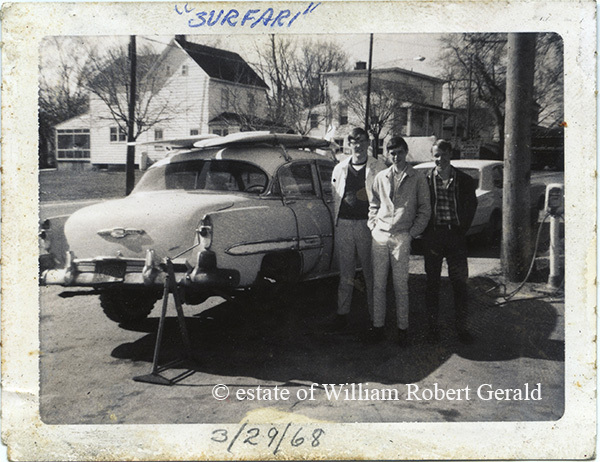 He was many things, hunter-gatherer, prolific reader, jack of all trades and surfer. Most people don’t realize the amount of photography he produced. I spent last winter going over thousands of photos he made since his early teens. Many of those images were inconsequential personal memories, but there are many that have merit. Taken from the north jetty. 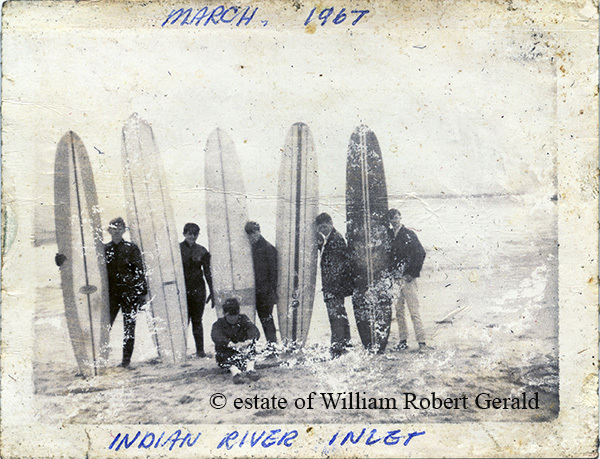 Of particular interest to me are Robin’s photographs contained in an album from his early days surfing at Indian River Inlet in Delaware. I didn’t know him then, but it’s about the time I learned to surf a 9’6” Bing there. It was a good wave and a good place for a young surfer to make friends and integrate into a new lifestyle. These old Polaroid photographs taken in 1967 and ’68 are one-of-a-kind originals. I think Robin is on the far right, the others are unidentified. I don’t know where this Polaroid was taken, but it looks typical of rural Delaware. A 19 year old Robin stands between two unidentified friends while changing a flat tire. A few years later, surfboards got a lot smaller. 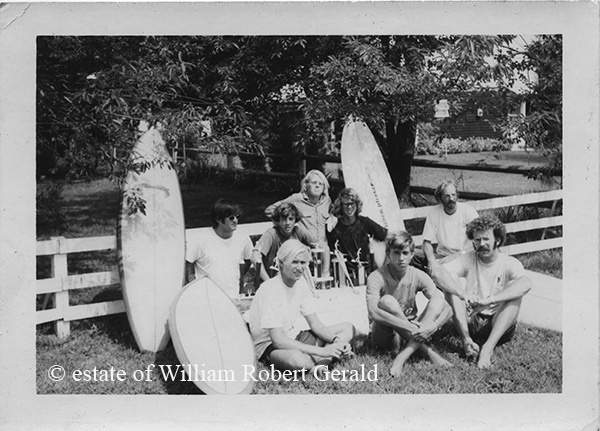 Robin took this snapshot of his team mates from Gemini Surf Shop out of Rehoboth Beach, perhaps about 1970. Dave Isaacs, Gary Revel, Jeff Ammons, Bryant Clark, Brent Clark, Skip Savage, Karl Gude and one unidentified. Who knows who he is? When most people take a picture, they don’t realize they’re making a historical record. As a photographer, I didn’t intend the pictures I took many years ago become history. But in retrospect, I see a lot of value in old photographs, the older the better. If I had it to do all over again, I would opt to do much more shooting of people or things that I routinely took for granted. 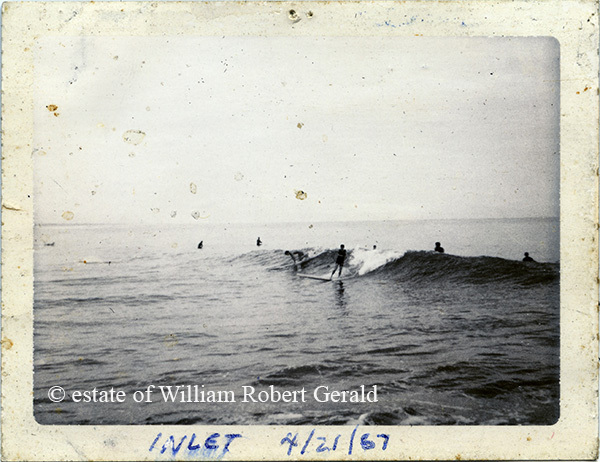 This entry was posted in beach, black & white photography, history, People, surfing on September 16, 2014 by j0jgvm89bj.